Asparagus’s constant growth calls for a relentless (almost daily) picking schedule, with stalks shooting as high as 10 inches in just 24 hours. The crop is only harvested in the spring, though it needs space in the garden all year. As long as you properly take care of the perennial, it will zealously do its job for years to come. Fifteen growing seasons down the road, don’t be surprised to see the same patch of asparagus sprouting just as quickly as during its first year. 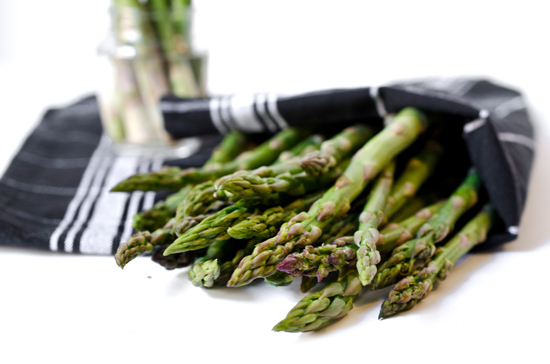 Asparagus also works hard in the kitchen; it’s delicious raw in salads, roasted whole or in creamy, blended soups, like the one recommended by Chef Christopher Kearse (p. 15). Pair asparagus with a glass of wine (or three) and the vegetable will do its best to fight a hangover. A 2009 study in the Journal of Food Science found that asparagus — especially its leaves — have two key enzymes that protect the liver cells against toxins and can alleviate potential hangovers. So fill your plate (and your cup) and celebrate the arrival of the spring growing season with asparagus. One cup of asparagus contains three grams of fiber, 20 percent of the recommended daily value of vitamin C, 30 percent of vitamin A and 11 percent of vitamin E, all for just 30 calories. It’s also a good source of iron, folate and other essential minerals and protein. Yes, protein. This veggie has roughly four grams of protein per one-cup serving. Bright green, firm stalks with tightly bound heads are all signs of fresh, young asparagus. Opt for stalks with dark green or purple-hued heads versus yellow-shaded tips, a sign of aging asparagus. Both thick and thin stalks are adequate, but aim for consistency to assure more even cooking. Once the season ends and the spears are let go, neatly planted rows of asparagus will transform into a wild, mangy forest. Rudman advises not to cut down the extra height until just before the next season. The stalks will dry out, but will stay attached to the plant, helping the asparagus survive the winter. However, you can tie the growth back to make a little extra room for ground-level summer crops. Christopher Kearse loves asparagus. “There’s just really no other vegetable that resembles it,” says Kearse, chef and owner of Will, a 30-seat, French-inspired BYOB on East Passyunk Avenue that opened in August (and shortly after was named 2012 BYOB of the year by Philadelphia Magazine). Critics have described his cooking as “fresh and unique,” and that’s in turn how he might describe asparagus. “The fresher you get it, the more flavor it will have,” says Kearse, who sources asparagus from Green Meadow Farm in Lancaster County. This spring, expect to see traditional dishes at Will, like poached eggs and asparagus topped with a champagne sauce and caviar, as well as more unusual appetizers, like a cold asparagus salad with rich truffles, or the dish featured below: mussels in an asparagus sauce. The creamy asparagus gives this classic dish a modern edge. “Mussels have this briny, salty characteristic, and the asparagus adds a nice earthy, grassy complement,” says Kearse. At the restaurant, the soup will be accompanied by a goat milk Chantilly rather than the Greek yogurt Kearse suggests as a quick alternative for the garnish. *If any mussels have an open or broken shell, remove and discard. Heat a Dutch oven over low heat and lightly coat the bottom with oil. Add half the onions and garlic. Cover the pan with a lid and cook until translucent, but not brown, stirring occasionally. Deglaze the pan with the vermouth and add chicken stock and thyme. Bring to a simmer, add mussels and cook for 5 minutes to steam open the mussels. Remove from heat and strain liquid into a bowl to reserve. Set mussels aside. Clean out the pot, then cook the remaining onions and garlic in a little bit of oil, using the same technique as before. Add mussel stock and simmer until reduced by 25 percent. In a large sauté pan, lightly coat the bottom with oil and heat over medium high. Add asparagus and sauté over high heat until caramelized but still not cooked all the way through. Add asparagus to the mussel stock and simmer for five minutes. Purée stock and asparagus in a blender with spinach until smooth, then immediately cool over an ice bath. Reheat as needed before adding the mussels. Garnish with a dollop of Greek yogurt. Asparagus is a terrific candidate for preservation. Because it has such a short season, get going as soon as it hits the markets. When you first bring asparagus home, trim the ends and stand the bundles up in bowls of water to maintain optimum freshness. To pickle, trim stalks to fit your jars. Blanch asparagus briefly and pack in jars with spices and a diluted vinegar solution. To freeze, cut away woody ends, blanch asparagus and cool rapidly in ice water. Dry, pack into freezer bags, squeeze out air and seal. Grace Dickinson is a food blogger, photo enthusiast and recipe creator. These passions are brought together on FoodFitnessFreshAir.com, where she chronicles her experiments in the kitchen.